This is only a test. No, we’re not going to talk about the good old days when we had air raid drills and hid under our desks at school. That would go too far toward talking about how old I am. This is What I Ate Wednesday, hostessed by the lovely Jenn at Peas & Crayons and best fun you’ll find for your money out here in Blog Land. Here is where the test part comes in. In Monday’s post, I revealed that I’m using my new camera. I love the results I’m starting to have when I take food photos. Only thing is, I don’t always have it with me and some of my photos are on my point and shoot, some on my DSLR. I don’t quite feel cool enough to drag it out in a restaurant, Yet! SO the test part comes in because I’m not sure if I can figure out how to hook up both to download the photos. They may be a bit orderless because of this. But, Hey…I’ve done WIAW without any photos at all, so this has to be better…somehow. Still don’t have much in the way of snacking, but again…hasn’t stopped me before! I think this may work, If I don’t electrocute myself! 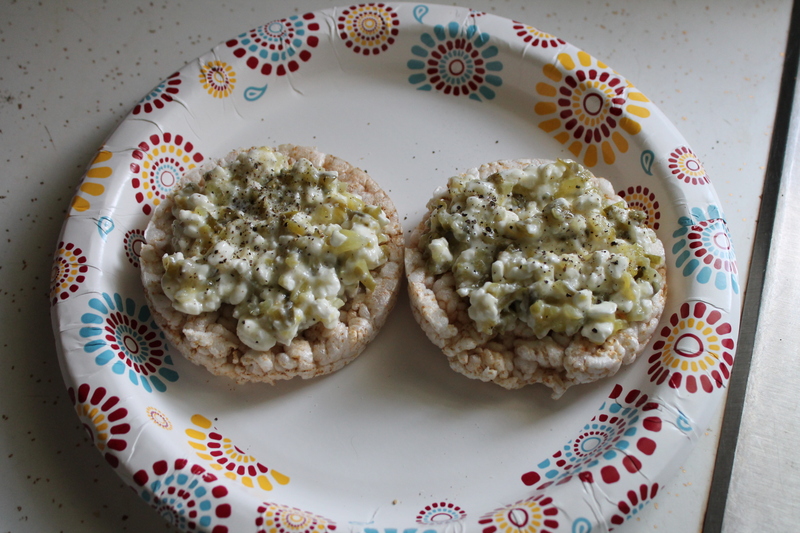 Cottage cheese, ground black pepper and sweet pickle relish combined on top of plain rice cakes. One of my favorites. Quick, easy and only 3 Points. 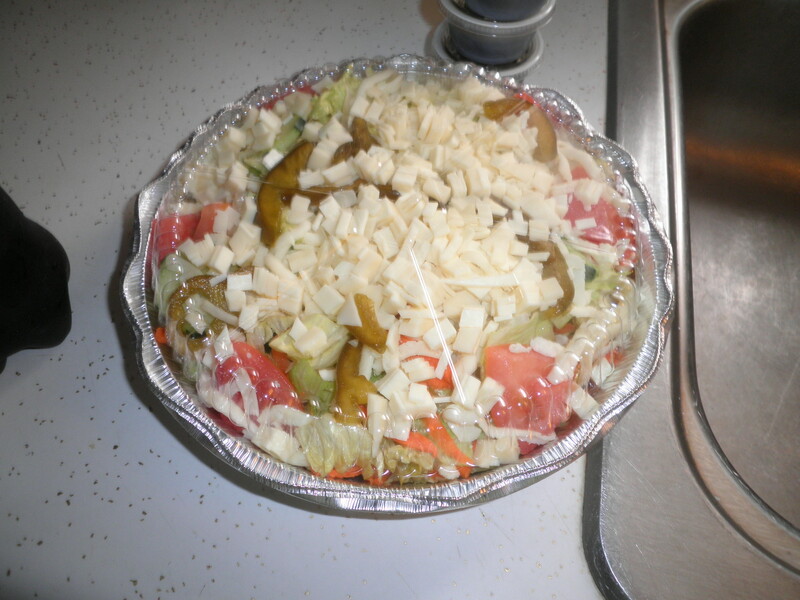 One of my traditionals…mixed cheese salad with balsamic vinegar from the local pizzeria. So good, which is why I have it so often. Breakfast out with my friends from Weight Watchers. 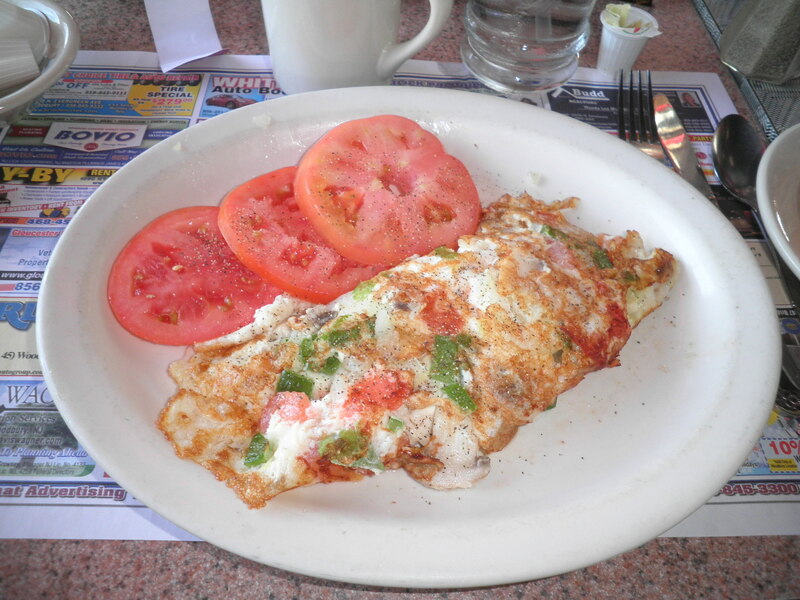 Egg white omelette with tomatoes, green peppers, onions and feta cheese. Sliced tomatoes on the side. So good and a fun visit! 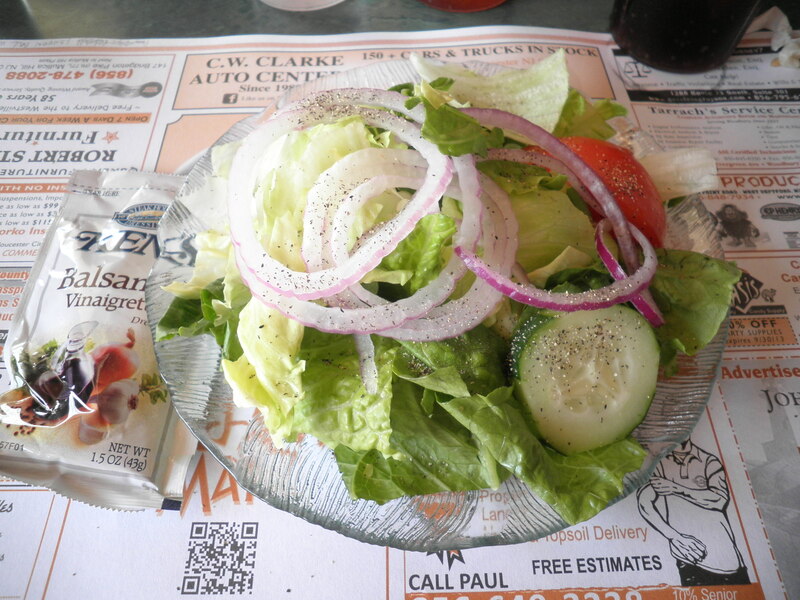 Side salad at lunch…It started out as Ralph’s but he didn’t want it so I took possession! 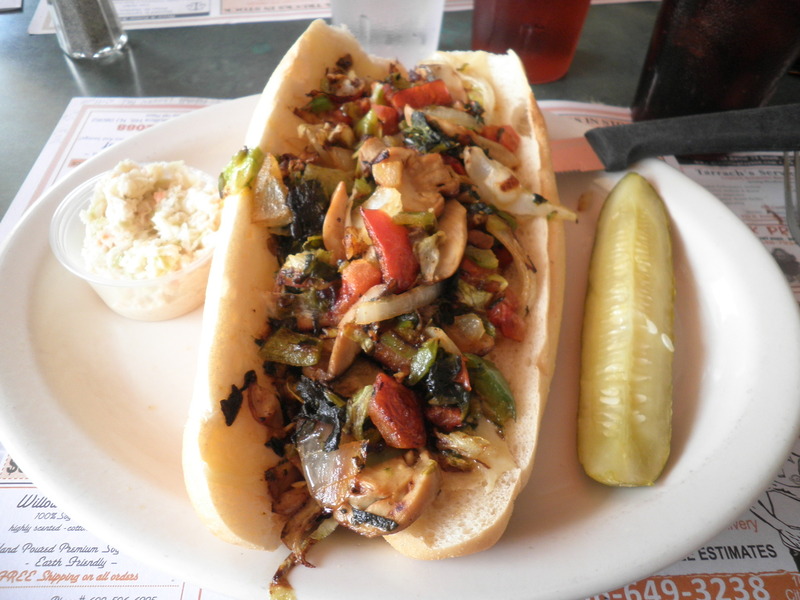 Veggie cheese steak…I have no words for how good this is!! You know I couldn’t do a WIAW without some ice cream. 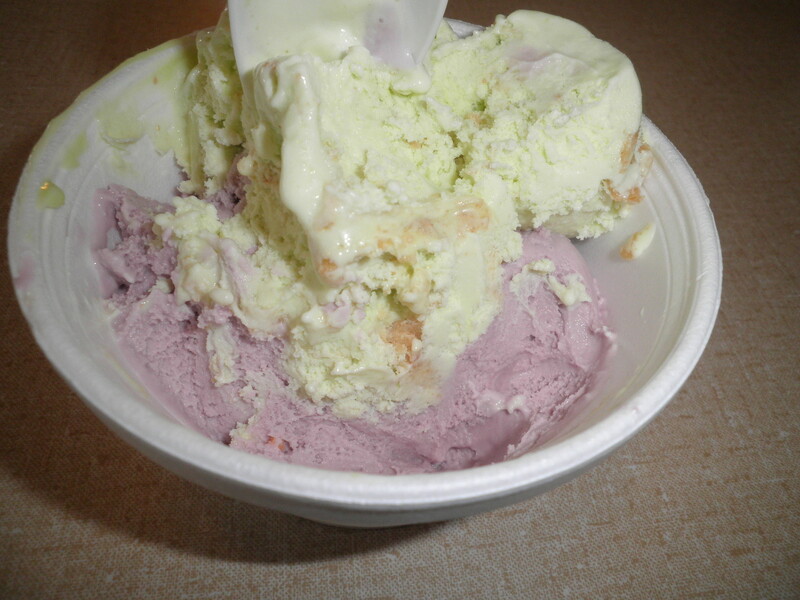 This was the very odd but incredibly delicious combo of black raspberry and key lime pie. So Good! Trying to be better about eating a Real breakfast. This is egg substitute and egg whites combined with chili garlic sauce, cooked in the micro for 3 rounds of 1 minute. Comes out perfectly. A Gala apple for some crunch. Very filling! Yummy breakfast! Gala apple with cinnamon, warmed in the micro for 2 minutes. 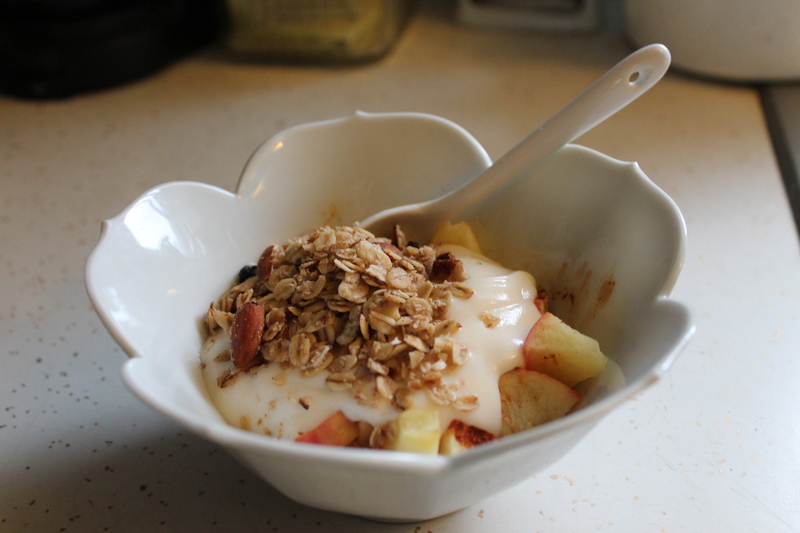 Topped with fat-free vanilla yogurt and that wonderful granola that I’m still working on! This was really good and filling! So as you see, I haven’t done a heck of a lot with snacking and I think it’s for the best. Staying on track is good and snacking, even good choices sometimes lead me down the wrong path. That’s What I Ate Wednesday for me. Please be sure to stop over at Peas & Crayons to check out the other wonderful food that everyone is sharing and be sure to leave some comments! Happy What I Ate Wednesday! Our grandson Patrick graduates from high school tonight…Can’t wait!! This entry was posted in Uncategorized and tagged beans, Big Purple Bowl, crock pot, photography, veggies, Weight Watchers, WIAW. Bookmark the permalink. Woah, that veggie cheesesteak sounds so good!! Oh, my gosh, Liz…it’s delicious! It’s my new Saturday treat to myself! These pictures look amazing! It’s almost as if I could reach in and eat that cheesesteak! Thanks, Katy! Have a great day! Hi Jennifer! 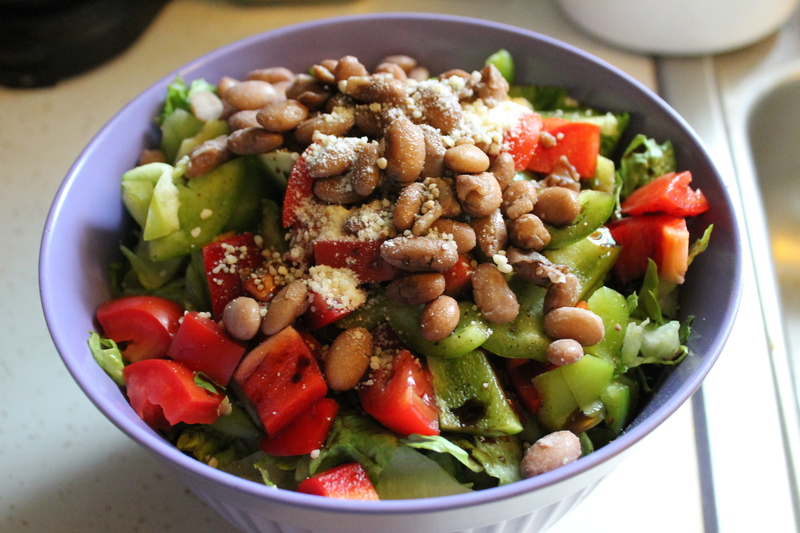 Glad you like it…it is so good all veggies and some cheese. Love it! Have a great day! 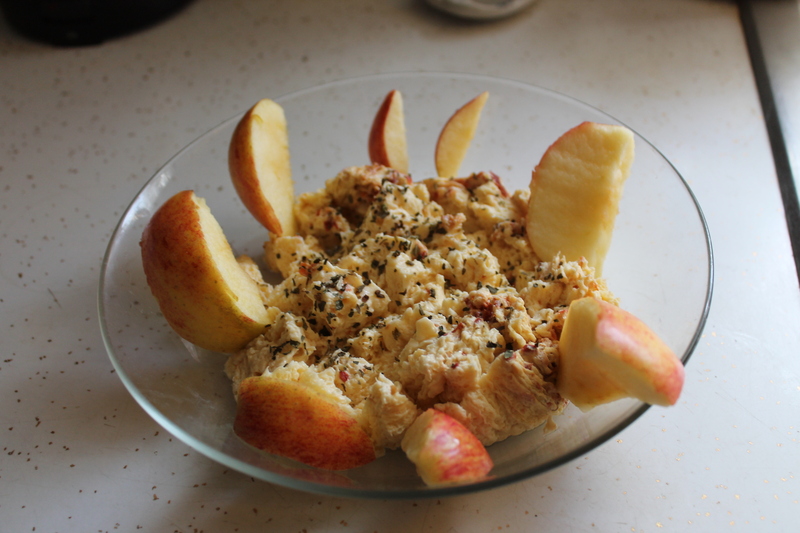 Oh that last recipe, the gala apple, looks simply wonderful! Congrats to your grandson! Thanks, Kaitlin, we’re pretty proud of him! I love the apple/yogurt combo. Have a great day! I’m still so in love with that veggie cheese steak! Thanks, Alex…I’m having fun with the new camera…still need practice, but you know how that is. The veggie cheese steak is SO good! Oh boy that veggie cheese steak looks tempting! Thanks, Natalie…it is really good! So this post is with the new camera, right? Because you can totally tell! They look great. The picture of the sub and salad look so clear. Thanks, Madison. Actually, it’s a combo…can’t remember which are which now!! I need to keep track of that. Enjoy your day, my dear! That’s a great idea, Madison! I was looking back at the post and I got confused, guess I’m not that good with the “good” camera yet, or it would be a clear difference. Have a great day! You got a DSLR?? What fun! Ohh, I can’t wait to see all the testing fun you have with it! And you’ll have to give a full review–I keep thinking about investing in one! I’m having a great time with it so far Allie! As Kristen told me, you can’t mess it up if you keep it on auto. I went to Patrick’s graduation last night and got some great photos! I’m feeling like a professional now…cough…choke… Have a great day, Sweetie! I vote rice cakes, purple bowl salad and egg/apple bfast and yogurt with granola bowl are with the dslr, others with point and shoot……? Thanks, I’m so confused I can’t remember now!! 🙂 Anyway, yes that sandwich is incredible. I’m so glad that my friend figured out that “veggie” cheese steak meant all veggies. It’s my favorite! hahaha — rice cakes, eggs + apple, purple bowl salad, apple + yogurt. those were my dslr guesses. so it must be true! 😮 i didn’t even see you take a photo when we were at breakfast! you have gotten so sneaky. color me jealous. But I only used my point and shoot for that one. Much easier to be secretive! !